The very latest technologies are now available to perform full fault code diagnostics & service light reset on major manufacturers/leading brands motorcycles. mono motorcycles now offers the very latest in motorcycle diagnostics & fault code reading capabilities for the major manufacturers motorcycles. With the new TEXA diagnostic software, we are able to diagnose underlying technical issues as part of a diagnostic programme. In addition, we can now reset service light indicators off as part of a full or major service, or as a stand alone service. mono motorcycles now offers the very latest in diagnostic capabilities for the leading brands current models of motorcycles. TEXA UK opened its offices in January 2006 by its current MD David Tempest, the CEO of TEXA Italy Bruno Vianello and Manuele Cavalli. 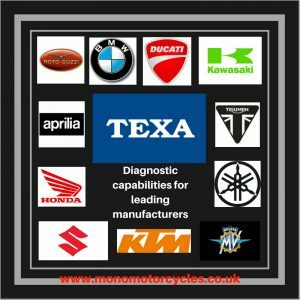 Today TEXA is a global leader in the design, development and production of multibrand diagnostic tools, exhaust gas analysers, air conditioning service stations and telediagnostic devices for cars, bikes, trucks, boats and farm machinery. TEXA has an extensive, worldwide distribution network and employs over 640 people, 400 of whom are based in the company’s head offices in Monastier di Treviso, where all TEXA products are designed, developed and made. Service light indicator reset is free as part of a full or major service. Service light indicator reset only carries a minimum charge of £48.00.